We woke to real sun, so we made it a day of exploring. We drove to the south coast again for lunch--this time to another port town on a very swift river, Auray. We went down a steep hill to the port area, where we lunched outdoors on moules-frites (F), and a mediocre salade niçoise (Darrell). Next stop was a town on the next peninsula, Carnac, noted for the ancient standing stones (dolmins, cairns, menhirs, and other "alignments") which, like Stonehenge in England, have no obvious explanation. We then drove south onto the côte sauvage of the Quiberon peninsula to find a coastline that could easily have been found in Maine (and may have once--before the grand shifting of geological plates--been actually connected). We stopped for wine and cider in the port, then drove back north to our new "home," hoping to eat in Rohan's little creperie again. It closes on Tues/Wed so we ended up back in the Rohan hotel dining room for a really BAD dinner (hard to do in France). My salad had dry pieces of andouilette and chopped dry crêpe pieces over tired lettuce. 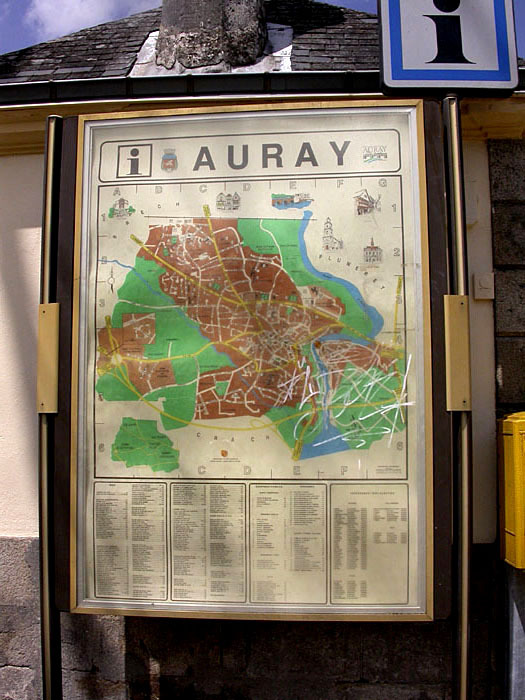 Sunburned, tired, disappointed with dinner, we found the only good thing about the day was the nice port of Auray, and the choice of John Edwards as Kerry's running mate--news delivered to our gite courtesy of CNN World Service.